I went to a restaurant recently and had a salad with a fried chicken breast. It sounded unassuming; lots of places have similar dishes. The salad was decent, but pretty basic — spinach and Romaine, cherry tomatoes, cucumbers, you know, the usual. But the chicken. The chicken was amazing. It was juicy, crisp, and flavorful. It was not greasy or soggy, and turned what I expected to be a mediocre lunch into something I couldn’t stop thinking about for weeks. In fact, as soon as I got home, I was on a mission to recreate this chicken. I’m still not sure I succeeded, but I made something that I think is pretty darn good. So before I started, I considered the things that go wrong with frying chicken breasts. First, a chicken breast is not the same thickness all through, so if you just cook as is, you end up with one side that may be overcooked, and one side that may be pink. Blech. Solution: pound the chicken breast. This also tenderizes it and makes it cook faster. Easy. Next, breading. Coarse breadcrumbs are a must here, so skip the canisters of dust they call breadcrumbs in your grocery store. If you have bread and a food processor, that’s the way to go, but Japanese panko breadcrumbs will work too. But breadcrumbs alone aren’t enough — they have to taste like something. For seasoning, I used a combination of Nana’s Italian Seasoning and Citrus Salt & Pepper, both of which I got from my Ava Jane’s Kitchen spice subscription. They added herby, citrusy goodness that gave the chicken the flavor I was looking for. The Nana’s Italian Seasoning is mixed with the breadcrumbs, while the Citrus Salt & Pepper is mixed with the flour. This way, the seasoning penetrates the chicken itself and not just the breading. Next up, frying. The temperature of both your chicken and your oil is what will determine whether you get crispy or greasy chicken. You want your chicken to be room temperature before you start, and your oil to be hot, hot, hot. Ava Jane’s Kitchen Avocado Oil works well here because unlike olive oil, it has a high smoke point, making it perfect for frying. It also helps that the flavor is perfect for the seasoning choices here. From there, you’ll just use a standard breading procedure. 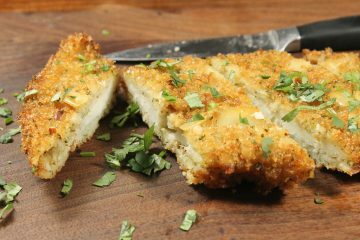 Dip the chicken in flour, egg, and breadcrumbs, fry until done. If you do it right, it’s perfection. You can eat this chicken on a salad, in a wrap, or alongside some mashed potatoes if that’s your thing. Combine the breadcrumbs and Nana’s Italian Seasoning in wide, shallow dish. In a separate dish, mix the flour with the Citrus Salt & Pepper. Put the chicken in a plastic bag, and using a meat mallet, pound it until it’s about 1/2 inch thick all around. Put a large, heavy skillet on the stove and let it get nice and hot while you bread the chicken. Dip the chicken in the flour mixture, then the egg, and finally the breadcrumbs, coating well. Press the coating into the chicken to adhere it. Add about 1/2 inch of oil to the skillet. When it starts shimmering, add your chicken. Cook the chicken until it’s browned and crisp on both sides, and cooked through. The internal temperature should be 165 degrees. Slice and serve on a salad or eat as a main dish. By the way, I love your avocado oil. Use it about 95% of the time when needing oil. Thank you! The best fried chicken I ever had was located about a mile from home – take out only. They closed a few months ago and I’ve been pouting since. Can’t wait to try your recipe! This sounds yummy: can’t wait to try it. Can I use Almond or? Nut flour ?